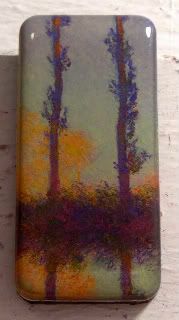 This magnet is one of my many, many, many Monet paintings - this one being an inset of the painting The Four Trees/Four Poplars. About a mile from Monet's house in Giverny is the tree-lined Epte River, where Monet used to sit in a boat in the water to paint these poplars. Part of Monet's visual vocabulary (if I'm using that term in the right context here, who knows) was light - and how light changed throughout the day and the year. Which is how Monet ending up painting series after series of the same subjects - haystacks, Venice, London, Rouen, water lilies, these poplars - so that he could capture the many shades of light. I picked this magnet today, because yesterday, I saw two movies that couldn't be more different - the tv movie Thomas Kinkade's Christmas Cottage and the blockbuster Avatar. But, the movie tried too hard to gain an emotional response from me, and I found myself spending much of the time waiting for Peter or Marcia to show up on screen. But it was the final scenes where Peter O'Toole's character was going on and on about his last painting, and how you muuuuust paaaaaint the liiiiight pretty much reminded me of Monet. It's the nature theme of these poplars reminds me of James Cameron's Avatar (in 3D at AMC Empire 25's FauxMAX theatre), which I was also pretty meh about. Oh, don't get me wrong, Sam Worthington was hot, knobby-knees and all. And, in the end, the Smurf people weren't as annoying as I was thinking they would be. And, the movie itself was gorgeous - and if you stop for a second to actually watch all the background plates and the CG work and SFX and the fact that it was a completely made-up world, you'd just be amazed at the sheer magnitude of the effort. There were a few callbacks to Titanic for me - some triumphant King of the World moments, a couple "I'll never let go" moments, oh, and a giant catastrophic event or two as well. But overall, I kept getting pulled out of the movie by the Cameron soapbox - how society (America) has a way of killing off indigenous peoples and how humankind can't stop itself from destroying Mother Planet. In fact, it felt very much like his directors cut of The Abyss (which of course I loved), where the aliens just wanted us to save ourselves from ourselves. ...or the $73 million he made during opening weekend. I really cannot believe that I missed that the overall story was just basically the story of Pocahontas. Huh. Right down to the Colors of the Wind and the talking trees!